Red Clocks by Leni Zumas. Little, Brown and Company, 2018. Hardcover. 368 pages. Red Clocks was incredibly disappointing for me. It wasn't a bad book, but it wasn't necessarily good, either. The premise of this book is incredibly interesting and had the potential to be a deep, challenging look at a difficult and divisive topic, but instead it seemed to completely miss the mark. I've seen mainly five star reviews for this book and one-to-two star reviews for this book, so it seems to be fairly hit or miss. I seem to be in the latter category, but of course I can only speak for myself on my opinions. Red Clocks takes place in a future in which abortion in America is now banned, in-vitro fertilization is now banned, and the Personhood Amendment, which designates full rights to every embryo.This book aims to explore that question "What is a woman for?" through the lives of five very different women. My biggest problem with this book was that the author seems to have lost the point she was trying to make amidst all of her usage of excessive literary frill. I'm a big fan of books with unique literary writing styles and I'm always open to new ideas, but in this case I just couldn't get into Zumas' style. The book was too choppy and disjointed and I had a hard time really caring about any of the characters or their lives. The narrative itself was very distant, and I didn't feel as if I was really experiencing or fully understanding what was happening in these women's' lives. It's almost as if Zumas left too much unsaid in her effort to make subtle but meaningful points, which thus created such a gap between myself and the direct events of the book. The four main characters are Ro ("the biographer), Gin ("the mender), Susan ("the wife"), and Mattie ("the daughter). There is also a minor fifth character, Eivor Minervudotti, whose life is somewhat explored by Ro, the biographer, who is writing a book about Eivor. Each chapter features the perspective of one of these women, and within that chapter Zumas refers to the character as their given moniker, rather than their name. Maybe she meant to do this to create a sense of distance between us and the character, or perhaps she did this to emphasize how women are often broken down and categorized into specific roles--whatever the reason, it was confusing and a bit annoying. These women all live in the same town, so they make appearances in one another's chapters and are referred to by their real name in those, but the character whose perspective the chapter is based on is not referred to by their real name, and it just made the reading experience a bit more frustrating. The book follows each woman as she deals with a particular issue: Ro wants to conceive a child while she still can, Gin is a sort of herbal "doctor" who provides items for other women's' ailments, as well as abortions, Susan is a housewife who resents her position, and Mattie is pregnant, unable to get an abortion. Each one of those should provide for a really interesting story that tackles a lot of heavy, complex issues, right? Well, not quite. Zumas really seems to have so badly wanted to stand out and make a point that the focus seems to be on the writing style itself, rather than on the stories presented by each character. The areas that I can applaud Zumas in are her vivid descriptions at various moments. When Ro undergoes vaginal exams, Zumas describes--almost too vividly-- the experiences, feelings, scents (yes, ew), and emotions that one may experience themselves. She conveys the dire consequences of women who attempt to get abortions and how traumatizing it can be. She captures these ideas and situations well, but there weren't enough of these moments to bring the book together. This book was obviously written with care and a keen eye for style, but I feel that this took over the heart and true meaning of what this book was supposed to be saying. The whole time I was reading this I just kept hearing a voice in my head saying, "But what about abortion ban and amendment--how are they affecting this society?? How is Susan's story affected? etc. etc." Look, I get the book on the whole, I get what it was trying to do, but unfortunately it didn't work for me. 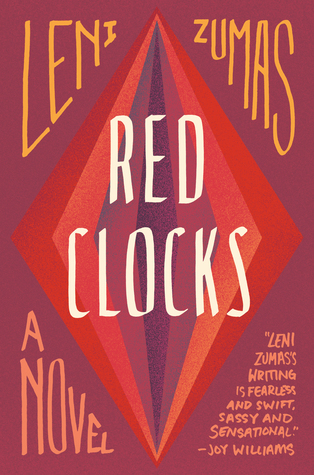 Overall, I've given Red Clocks two-and-a-half stars. It just wasn't for me. I initially gave it three stars, but the more I look back on it, the more frustrated I am. I can understand how some people love this book, but I felt it wasn't worth the time I gave it.